Caracas in May 2017 shook with march after march as citizens poured into the streets protesting against the government. State security forces spread stinging, putrid clouds of tear gas and pellets over the crammed masses of people. Many young people organized themselves and formed groups known as “the resistance.” Armed with cardboard shields, they faced the repression, throwing rocks and homemade molotov cocktails at the security forces. The scenes captured every day were of heated confrontations that left many dead or wounded. Ángel Zambrano frequently attended the protests but was convinced violence was a wrong and ineffective way to solve Venezuela’s problems. He worried, even more, when he saw one mob of demonstrators throwing jars full of excrement at the security forces. While he was fleeing, thinking such creativity had to be channeled, he met José “Cheo” Carvajal, an old co-worker, specialist in urban planning and public space. They both had the same concern. Days later, in the well-known Caracas bookstore Lugar Común, a few meters from the Plaza Altamira – one of the epicenters of the upheaval of those days – Carvajal and Zambrano held their workshop. The event was standing room only. Megaphones had to be taken outside so the overflow of attendees could hear. Ideas emerged among the enthusiastic audience. Carvajal and Zambrano wrote down the email addresses of those who attended and set up more meetings. Every Thursday, while the roar of explosions and marches continued outside, they gathered, surrounded by books, to reflect and articulate other ways of protesting. It was an appeal for civility. They decided to name the initiative the Citizen Laboratory of Nonviolent Protest. Like a laboratory, they sketched proposals, put them into practice and returned to the drawing boards to analyze the results, making modifications and implementing them again. They considered going beyond the specific circumstances of the time. “You have to bring violence down by two and raise the intensity by four with sustained strategies in the long term, because the idea is not only to change the government, but to strengthen the democratic culture. It’s not about throwing punches first and then building a democratic culture later,” explained Carvajal. From the Citizen Laboratory of Nonviolent Protest emerged projects like el BusTV, a live newscast on buses to combat misinformation; Billete Alzao, a banner made with 3 thousand 2 bolivar bills (equivalent at that time to 1 American dollar) to draw attention to the devaluation of the local currency; Venezuela se levanta, a collection of stories of people who did not surrender in the face of difficult situations; Piloneras, women singing traditional Venezuelan melodies in the streets with a protest twist; and Dale Letra, citizens raising letters to form critical, provocative phrases. The turbulent protests in Venezuela were extinguished in August 2017. But the laboratory has kept going. It’s since changed its name to the Citizen Laboratory of Active Nonviolence. “We were realizing that our work had to transcend beyond the protest itself. Nonviolence is an alternative to an authoritarian regime,” said Zambrano. 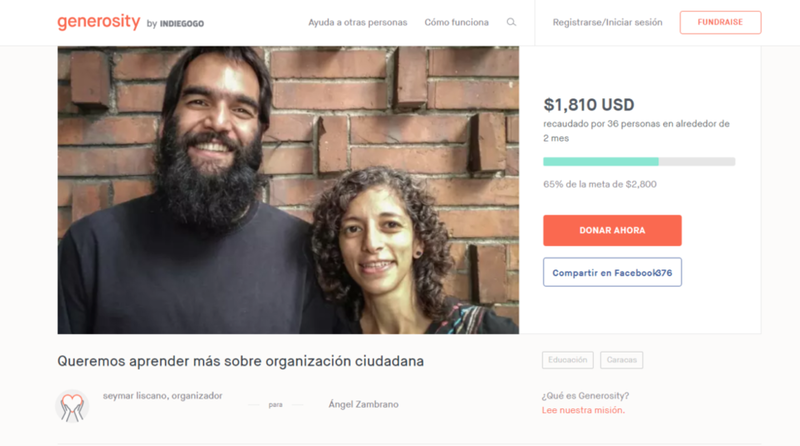 The Citizen Laboratory of Active Nonviolence has been raising funds to travel to Quito, Ecuador to attend a strategic non-violence program and citizen organization workshop. The organization doesn’t have a fixed location, but works in open spaces of the city: a university, a park, a library, borrowed offices. About 15 people meet each week, less than when everything started. Many had to return to their daily lives, work and studies when the streets resumed their usual rhythm. But those who remain in the laboratory insist it must continue, because the country plagued by devastating hyperinflation, a complex institutional situation and an overwhelming social crisis needs it to. To the group’s delight, the work of the laboratory has been recognized. Zambrano and Seymar Liscano were selected from over 200 people from different parts of the world to take part in a strategic nonviolence and citizen organization program. The week-long program will take place in Quito, Ecuador in mid-February. “We have always been teaching ourselves through online programs, with materials coming from the United States and Europe; but this is an opportunity to meet other activists in the region in person, exchange Latin-American experiences, know what problems they are working on and how they have addressed them. For us, all of this is very new, but there are people who have been working on this for a long time, so going will help us fine-tune the work of the laboratory,” Zambrano said.